Remember when Allegri said the players were going to bed right after dinner on the night the scudetto was won? I'm not sure how many of you are aware of this, but during that dinner, Berlusconi used the fact he outranks Allegri to let the players celebrate until 5 A.M. Am I looking for excuses? Sure I am. The team didn't play too poorly today but some players seemed unmotivated and slower than usual. That's what I'm like after a hangover too. Ibra apparently had a knock of some sort and was therefore allocated to the bench. Boateng's absence from the starting line-up, however, is a mystery to me. Seedorf has been playing well but it was plain to see he couldn't cut it in such a demanding position. So, was Boateng left out because he was jaded? I doubt he will ever be nearly as jaded as Seedorf until he's deep into his 30s himself, so the decision was indeed puzzling, especially with Pirlo's recovery. Pirlo had a wonderful first half, I believe he didn't misplace a single pass and his best moment came only 3 minutes into the game when he set up Robinho with a beautiful ball. I wasn't excited however, as I saw Robinho would have to shoot with his left and there's a 2% chance of success there. He duly delivered a rugby shot into the air, and kept missing the goal for the rest of the game. When he didn't miss the ball itself, that is. Milan dominated possession as usual but something about the Renzo Barbera makes our strikers choke. Pato was virtually invisible all through the game. He only had one dangerous attempt but Sirigu watched the ball sale by the post. His biggest contribution today was getting kicked in the face by Bovo who got his marching orders and made it possible for Milan to spend the last 15 minutes attacking, led by Ibrahimovic who made the difference in the attacking third as soon as he came on. Having not seen Milan lose in a while, and only 2 days after the title was won, watching this game brought a whirling pool of emotions into my head. I'm not being emotional however when I say that Zlatan is still the man. The Man. The determination, skill and sheer power he brings is unequaled by any of our other forwards, as was evident today. He was unlucky enough to hit both posts with one shot (for the second time in the season), muscled defenders off the ball, got a yellow card for being himself and scored a late goal while Robinho, Pato and Cassano collectively failed to make a contribution. Van Bommel's red card was disputable, he did make contact with Ilicic but the fall looked like a dive, and not a well executed one either. I was surprised the penalty was given, as were Hernandez and Ilicic judging from their reaction. The red card was a natural consequence, as was Bovo's two minutes later when he mistook Pato's head for the ball. I'm just glad Pato got out of that without any consequences, with his luck I would have expected him to miss 4 months of football due to breaking some irrelevant facial bone. Thiago Silva was absolutely monumental, while Abate wasn't his usual self, in fact he had a few moments that reminded me of himself from last season, and it wasn't pretty. 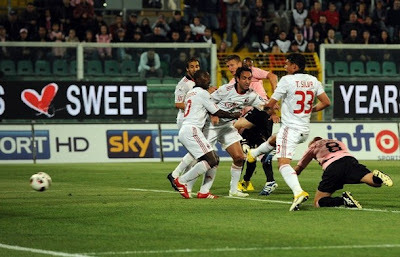 The little slip-ups didn't have much of an effect however, and it was a set piece that was Milan's undoing once again. The thing that really troubles me is the way Milan attack set pieces, and it's something Allegri needs to address during the summer so that we may score some goals from corners next season. Speaking of next season, the transfers of Taiwo and Mexes have been all but confirmed, and I salute the management's new-found willingness to address the problem areas in the team. All in all, Milan could have progressed to the final to meet Inter once again, but there was something lacking tonight, be it luck, determination or sobriety. Or all three. The Cup is lost once again, but I urge you to think happy thoughts, as Milan's return to glory has begun and those of you who weren't there for the last great period may be in for the most amazing couple of years of your football-watching careers. We have a new coach, a new willingness to succeed on the part of the management, a potentially devastating attack, a rock-solid defense, another title under our belt and a promising transfer market ahead of us. Forza Milan!